HawkGrips was founded in 2012 with a singular focus in mind – to help people heal. HawkGrips instruments are precision-engineered to be the ideal IASTM tools for any practitioner, and have been created with the direct input from clinicians and patients. 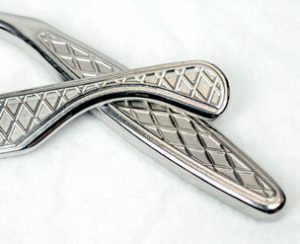 Cast from surgical grade stainless steel, the instruments are manufactured through a multi-step process and hand polished all within 100 miles of their Pennsylvania headquarters. With textured cross-hatch gripping, the instruments are designed to decrease fatigue and slippage for the therapist without sacrificing quality of treatment for the patient. HawkGrips also offers the most instruments on the market, available in a variety of sizes with numerous treatment edges, including single and double bevels. This variety ensures precise treatment for patients of different sizes and age groups. Not only does HawkGrips make the best instruments, but we also offer superior education and employ the best instructors to teach you how to utilize them. Instrument Assisted Soft Tissue Mobilization (IASTM) is an advanced form of myofascial mobilization — similar to deep-tissue massage. It is primarily used to detect and release scar tissue, adhesions, and fascial restrictions. This technique enables a clinician to locate adhesions and restrictions in the soft tissue through the vibrations or undulations of the instruments. Once these areas have been identified, clinicians may then utilize the instruments to restore optimal function. Who can be treated with HawkGrips? Anyone! HawkGrips are an excellent modality not only for treating injuries and chronic conditions, but also for preventive maintenance, recovery after a workout, and increasing range of motion in healthy patients. They are safe for use with the general population, as well as many pediatric and geriatric patients. Your doctor or clinician can tell you if IASTM would be an appropriate choice for you as an individual. A wide variety of conditions can benefit from treatment with HawkGrips instruments. Ask your clinician to assess if IASTM with HawkGrips would be right for you! Why Should Clinicians Choose HawkGrips? You don’t settle when it comes to the quality of treatment for your patients, so why settle for anything but the best instruments? HawkGrips products not only provide exemplary patient outcomes, but also keep your own physical stress levels at a minimum due to the ergonomic design and non-slip grips. Your patients will thank you for having the highest-quality products in your office, and you will see the results as patient referrals increase!